To manage and organize files and folders in a systematic way, file management section allows the members to move their files and folders into different folders. 1. Select file(s) or folder(s) you want to move. 2. Click on Move Icon. 3. On click, Move to popup will be displayed. 4. Select the folder in which you want to move file(s) or folder(s). 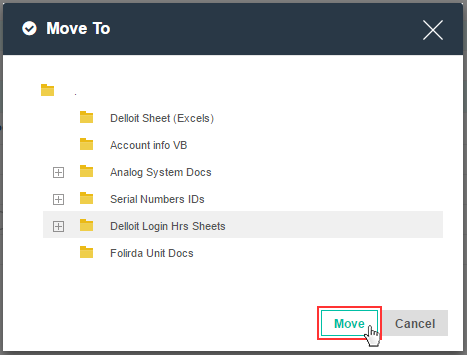 Once you will click on move that particular file(s) or folder(s) will be moved to selected folder. User can also simply move files or folders by dragging and dropping them to desired folder. Multiple files and folders can also be moved at a time. 1. Select multiple files and folders using Ctrl Key. 2. Follow the above steps or simply use drag and drop functionality. All files and folders can be downloaded by any team members within a project. 1. Select the files or folders you want to download. 2. Click on Download icon. On click files/folders will be downloaded. 2. Follow the above steps. On click multiple files and folders will be downloaded and zip file will be created. All files and folders can be deleted by any team members within a project. 1. Select the files or folders you want to delete. 2. Click on Delete icon. On click, popup asking for confirmation message will be displayed. Click on delete button if you are sure and want to delete file(s) or folder(s).